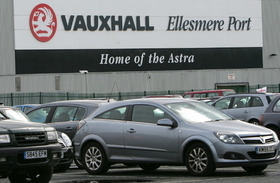 Vauxhall's Ellesmere Port plant will make the new Astra starting in September. RHJ International, the Belgium investment company bidding for Opel, will not close the carmaker's two manufacturing plants in Britain and is committed to the Vauxhall brand, weekend reports said. RHJ wants to keep a strong industrial and brand footprint in the U.K., The Sunday Times quoted the company's CEO Leonhard Fischer as saying. Production in the U.K. is also a natural hedge against currency fluctuations, RHJ executive Gerd Hauesler told Germany's Frankfurter Allgemeine Zeitung. Opel had already lost a lot of money when the British pound was strong against the euro, Hauesler told the newspaper. Vauxhall employs about 5,000 people in the U.K., with manufacturing plants at Ellesmere Port, northwestern England, and a van factory in Luton, near London. The Ellesmere Port plant builds the Opel/Vauxhall Astra and will be the first European factory to begin production of the new-generation model in September. RHJ is in a bidding war with Canadian-Austrian supplier Magna International to buy a majority stake in Opel from parent General Motors Co. GM is selling the loss-making carmaker to win financial aid from the government in Germany, where Opel has most of its factories. Magnas offer says Luton and Belgium's Antwerp plants could be shuttered. U.K. unions fear that a new Opel owner would close both U.K. plants and ditch the Vauxhall name as part of a cost-cutting drive. Britain has long been the largest market for Opel/Vauxhall but it has been overtaken this year by Germany, where government scrappage incentives have boosted car sales since their introduction in February. In the first seven months, Vauxhall's new-car sales in the U.K. were down 28.3 percent to 140,617, according to the SMMT industry association, making the brand the country's No. 2-selling marque after Ford Motor Co., whose sales were down 12.75 percent to 183,769. In Germany, Opels seven-month sales were up 32.6 percent to 219,927, according to the KBA federal vehicle agency.